As part of my drivetrain transformation I am replacing my C6 automatic transmission with a 5-speed TKO600. 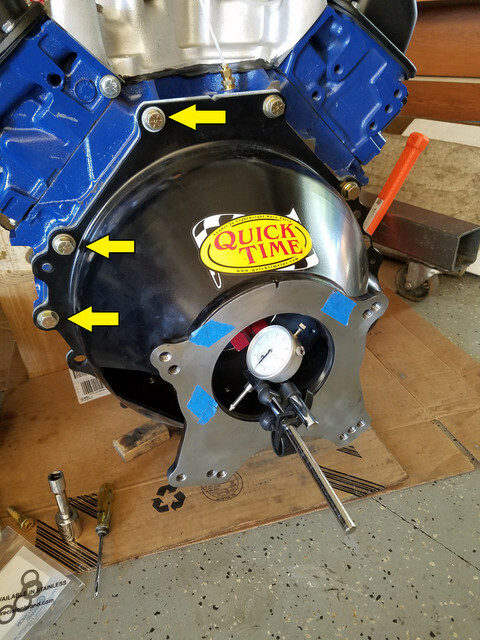 The bellhousing is a Quick Time. The TKO is very sensitive to the alignment between engine and transmission. Therefore you have to pay special attention in this department. Here are the steps I took. First I checked the alignment of the flywheel. To do that I used a dial indicator based on the engine with the pointer on the flywheel (at the largest diameter possible). I rotated the flywheel couple turns while watching the indicator. The maximum total (TIR) misalignment allowed is 0.002" and my measurement was right at 0.002". Then I assembled the bellhousing to measure the parallelism between the flywheel and the back of the bell. To do that the base of the dial indicator is as close to the center of the flywheel as possible with the pointer riding on the back surface of the bell (at the largest diameter possible). The maximum TIR allowed is 0.002". Mine was at 0.005". I then filed the edges of the bell and engine, and removed any paint from the mating surfaces. This resulted in no change. One of the recommendations is to shim the bellhousing. I sourced a few 0.005" round shims from Amazon to place at the bolts between the block plate and engine. My first try was to place two 0.005" shims on the two right-most bolts and one on the top bolt of the right side. The idea here was two create a canted offset with the washers. My first try was it. The parallelism TIR measure was below 0.002", at ~.0015". I then checked for soft foot. What you do here is place the pointer facing each bolt, zero the indicator and then loosen the bolt. If the bolt is forcing the bell into place it will spring back and give you a high reading. From what I read you don't want to have more than 0.002", but there was no number recommended for bellhousings. My readings were below 0.001". The final measurement and it is the most widely shown in the instructions is the concentricity of the bell's opening. 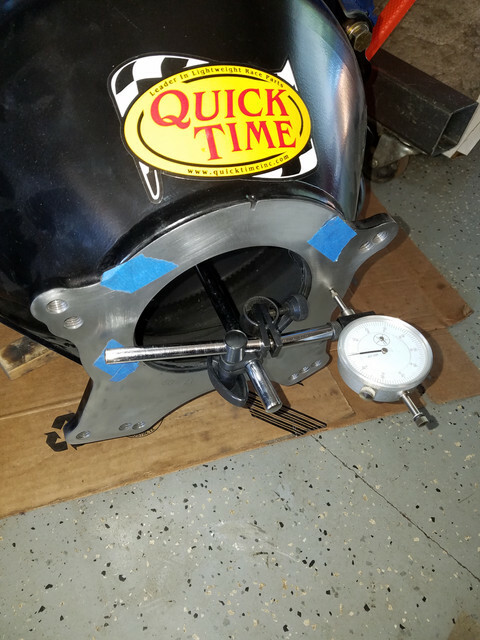 Luckily the TKO has a round opening so you base the dial indicator on the flywheel and place the pointer on the inner bore of the bell's opening. You are looking for a reading lest that 0.010" TIR. Mine was at 0.003". So success. Now I have an aligned engine and transmission. The verdict is still out there since I have not yet tested it. Most instructions only show the concentric measurement, but if your bellhousing is not parallel it will affect the concentricity. Before I took care of the parallelism my concentric measurement was at 0.011". Once I did the parallel adjustment with the shims the concetricity went down to 0.003". Beware of some pictures/videos out there in the internet where there is an angle between the pointer and the surface you are measuring. If this angle is small it is not a big deal, but the bigger the angle is the lower your measurement will be. Ideally, if you have an angle, you should approximate the contact angle and then divide your dial indicator measurement by the cosine of that angle. Yes, trigonometry 101! The yellow arrows indicate the bolts that were shimmed. Two shims on the two right most bolts at the bottom and one shim on the top-right bolt. The shims are tricky to put in place while the bolt is inserted. It will require some dexterity to install once the engine is in the car. A magnet to hold the shims while the bolt is inserted should be helpful.